As you know, social media promotion has become absolutely ESSENTIAL to building your salon and growing your clientele. It’s something that you simply can’t afford to ignore. If you’re not staying active on Instagram and Facebook by posting engaging content that draws people in and makes them say “I NEED to book an appointment here!”… then you’re doing a huge disservice to your business. I work with salons regularly to help them figure out exactly how they SHOULD be using social media -especially Facebook - to promote their businesses. (In fact, I’m running a special live workshop this week called “How to use Facebook to build your salon clientele in 2019” where I show you exactly what you SHOULD be doing on Facebook). But I see a lot of the same costly mistakes popping up over and over again. Things that are costing them not only wasted time, but are preventing them from attracting their perfect clientele on Facebook. 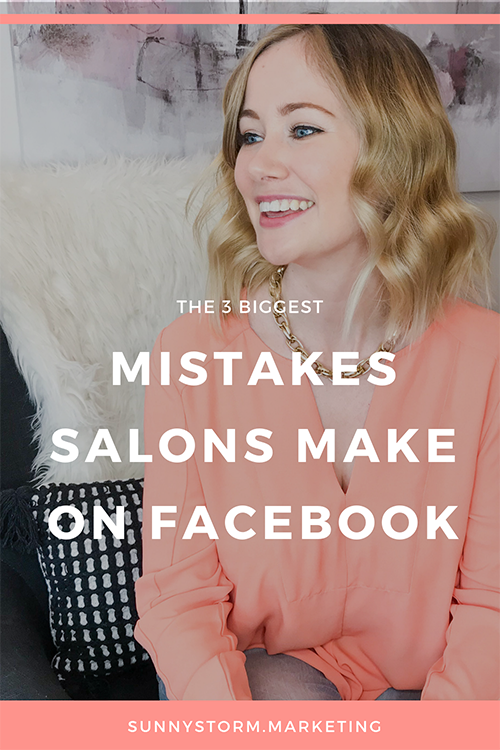 If you’re a salon owner or beauty professional and you’ve got a Facebook page for your business, some of these mistakes might surprise you, and help you to figure out what to do INSTEAD to attract clients on Facebook. I know that many beauty business owners prefer Instagram. However, Facebook is equally if not more powerful, it’s just different. One of the most important “hidden” features that Facebook has that Instagram is lacking? I can’t stress enough how important your Facebook reviews are for attracting people to your business. But so many beauty business owners are leaving them to chance, or ignoring them complete. This is a huge mistake. Social reviews provide “Social proof” to people researching your salon. Before deciding whether to book their first appointment, they will most certainly look to see what other people are thinking. In fact, for myself, online reviews are my number 1 way to choose between one business and another. I’m sure you’ve done the same thing. So why are you not putting in place a strategy to consistently get amazing Facebook reviews for your salon? This is not something that you should leave to chance, otherwise you risk turning away your next amazing client because they saw you had only a small handful of lukewarm reviews. Set up an automated email or text message to go out to your clients after their appointment. Tell them that you hoped they loved the service your provided, and ask them if they could leave their honest feedback. Don’t explicitly ask for a 5-star review, but do include a link to your Facebook page. If you’re not comfortable asking every single person for a review, you can narrow it down only to your top clients. Once a month, make a list of your “all star” clients and reach out to them, saying you appreciate their loyalty and you would love to get an honest review from them on Facebook. The more you share, the more you get! Be sure to be regularly sharing your top reviews on your social media posts, at the bottom of your newsletters, and on your website. When you show how much you appreciate them, more clients will feel inspired to leave your their own recommendation. Do you see how easy it can be to capture interest through positive social reviews? If you want even more ideas for how to get more attention and bookings on Facebook, you might like my upcoming workshop all about how to get more salon bookings on Facebook in 2019. I can’t tell you how many salon Facebook pages I’ve visited that are chock full of beautiful hair, nail, brows photos, but are strangely missing any photos from the OTHER side of the camera. What I mean is content showing you and your staff. Your smiling faces, your personalities, your opinions, expertise, advice. And the best way to express all of that? Through videos. Of course I’m not saying that you shouldn’t publish photos of your work. That is an extremely important part of your social media content. But, those photos only tell part of the story of your business. They show the world how skilled and precise you are. How much you care about the quality of your work. But they say nothing about what type of person you are, and they don’t invite people to WANT to get to know you, to trust you, to like you! So, what’s the most important thing you can do to start showing up more on your salon’s Facebook? Do more videos! Even if you just start with a 1 minute video introducing yourself, that’s great! Then you can graduate into videos where you introduce your staff, talk about your favourite retail products, educate about the difference between your services, talk about 5 common questions you get, etc etc. And then, once you’re feeling more confident, I highly recommend that you try out live videos. Live videos will ALWAYS get better reach and engagement than any other type of content you publish, guaranteed. They are by far the best way to show up and start building your personal brand as a beauty professional. Want more ideas for what kind of content your clients ACTUALLY want to see on Facebook? I’ll be sharing all the juicy details in my upcoming Masterclass where I share 4 secrets to creating irresistible Facebook posts that you can actually track to bring in clients. Facebook ads can seem very intimidating at the beginning, I know. You’re not sure how much to spend, what to post, or who to target. It seems so much easier just to put some money into a boosted post and call it a day. Besides, the Facebook Ads Manager looks seriously confusing, with all those numbers, buttons and options. I’ve worked with salon clients on Facebook ad campaigns where we spend just a few hundreds dollars in a month and got THOUSANDS of dollars in bookings. Facebook Ads do not have to be expensive or difficult. And they can be extremely profitable. Yes, there is a place for posting pretty photos, fun videos, memes, quotes etc without turning it into an ad. And you do need to keep “top of mind” with beautiful content that you share, and let people researching you to “creep” your page. BUT when you feel like it’s time to pump things up and speak to your ideal clients and get them to book an appointment, there’s nothing that works quite like Facebook ads. They let you choose who exactly you want to target, they give you an advertising space where you can share fun and friendly video to introduce yourself (unlike Google text ads), AND you can put in as little as 5$/day into ads and get huge results. Lots of salon owners have had bad experiences with advertising in the past, or have put some money into boosted posts and not been sure whether they work or not. But I promise that when you have step-by-step guide to follow, things get so SO easy and it’ll all fall into place exactly how to make profitable Facebook posts. Imagine never needing to come up with more creative ideas whenever you want to run a promotion or get more appointments. Do Facebook Ads sound like something you want to try out to grow your salon clientele? If so, you’re going to love my workshop coming up where I show you exactly what goes in to a profitable Facebook ad campaign. You can click here to grab your seat on the Facebook Masterclass while it’s still available. Okay, but exactly do I need to post on Facebook to attract clients? Now that you have an idea of the 3 big things to avoid for your Facebook page, you’re probably wondering exactly what you need to be publishing to actually be successful? What kind of posts on Facebook bring in not just likes and comments, but appointments and revenue? I’m going to show you exactly what you need to know about how to use Facebook in 2019 in my brand new Masterclass, and I’d love you to be there!